The Institute for Jewish-Catholic Relations is dedicated to providing opportunities for Jews and Christians to be "study partners." For this reason, and in cooperation with the Department of Theology and Religious Studies and the SJU Honors Program, many courses are team-taught by a Christian and a Jewish professor (asterisked below), who collaborate in exploring the relationship between Judaism and Christianity together with students. The Institute has long-standing collaborative relationships with many organizations devoted to interfaith relations, including the American Jewish Committee, the Anti-Defamation League, the Archdiocese of Philadelphia, the Consortium of Holocaust Educators of Greater Philadelphia, the Jewish Community Relations Council, the Herbert D. Katz Center for Advanced Judaic Studies of the University of Pennsylvania, the Jewish Christian Studies Program at Gratz College, and VAAD, the Board of Rabbis. It also enjoys strong ties with several synagogue congregations near the SJU campus. In the photo above, the Institute hosts a dialogue called "Friends in Faith" between high schools students from the Jack M. Barrack Hebrew Academy and Pope John Paul II High School. The Institute directors publish regularly in the field of Christian-Jewish relations, including in popular, ecclesiastical or Jewish, or scholarly books and articles. These include periodicals or journals such as America, The Christian Century, Commonweal, Crosscurrents, Horizons, The Jewish Daily Forward, The Jewish Exponent, The Journal of Ecumenical Studies, and Studies in Christian-Jewish Relations, in addition to contributing frequently to books of collected essays. Their individual writing and research is regularly enriched by their joint study sessions. The Institute has been a cosponsor of a number of international research studies. One of them produced the important collection, Christ Jesus and the Jewish People Today: New Explorations of Theological Interrelationships (Eerdmans, 2011). Consultation of the PLH research project, Jerusalem, 2015. More recently, it is among the university supporters of a multi-year project funded principally by the International Council of Christians and Jews. 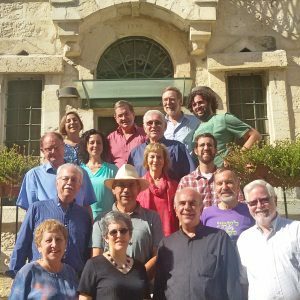 Its purpose is to prepare materials for use by congregational dialogue groups to engage in constructive conversation about Israeli-Palestinian issues. The resulting volume, entitled Enabling Dialogue about the Land: A Resource Book for Jews and Christians, will be published by Paulist Press / Stimulus Books. In addition, Institute directors Philip Cunningham and Adam Gregerman both serve on the Board of Directors of the Council of Centers on Jewish-Christian Relations, with Cunningham managing its documentary website, Dialogika and Gregerman serving as reviews editor for its online journal, Studies in Christian-Jewish Relations. Both are also involved in different ongoing national Christian-Jewish dialogues.